Like most other Siemens appliances, particularly ovens, the HN878G4S6B Black Stainless Steel Single Oven is a wonder of style and engineering. Steve Jobs once famously declared that design is not just how it looks, but also how it works. 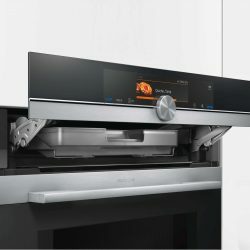 This oven / microwave is testament to the that with such useful features as Home Connect, a large colour TFT touchscreen, a self-cleaning function called activeClean, and pull out telescopic shelves. An excellent Sabbath setting (Shabbat mode) proves particularly useful for Jewish users wanting to remain Shabbat compliant. This is quite a rare feature in consumer ovens, so it is worth noting if this is an important feature for you. The door on this particular model is softMove, which means it won’t slam shut and instead appear to glide closed which is much nicer I’m sure you’ll agree. Other features include a control panel lock, electronic oven clock timer, pyrolytic proof enamelled pan and wire racks, and 15 heating methods. To get you going quickly a fast pre-heating function ensures you’re up to temperature without having to wait, and a descaling programme keeps things clear. Like pizza? You’re in luck, because a dedicated pizza pan is included, in addition to a full width enamelled pan. To top it all off there are 2 wire shelves. What more could you want?